This is part of the Make Summer Camp project. The rules are pretty simple: Make ten things between June 21 and September 21. Of course, two of those months are now gone. Which means that it’s crunch time, people. Are you in, or are you out? I’ve more or less finished my own challenge, but I’m curious if you’re still working on your ten, or if you finished a few of them and haven’t told me. I’ve made books, worked my way through a ton of origami, built a machine, sewed a tunic and wrote a couple of knitting reports, sewing reports, and carpentry reports about my efforts. There was even a progress report. What did you do this summer? This continues my painting projects. It’s been a long time since I’ve been home long enough to work on one of these paintings. Given that my habit is to mix a batch of color, or two batches of two different colors, and apply those one or two colors to six or ten canvases at once, not being home is challenging. Let me explain further. When I first started painting, my habit was to buy individual mini-tubes of various colors from the acrylic paint aisle at Michael’s Arts and Crafts. The result was that I tended to expand the palette of colors hugely, because I ‘needed’ dozens of paints instead of just four or five. Then my mother the artist explained a few things, and an artist colleague of mine explained a few more. The base of color theory, as most of my readers know, is that there are three primary colors — red, yellow, and blue. There are also three principal tinctures, namely white, black, and gray. By combining the primary colors with each other, one gets the secondary colors: purple, orange, and green. By combining the primary colors with the tinctures, one gets lighter or darker versions of the primary and secondary colors. These primar and secondary colors, and there various hues from very dark red up to very light purple, are generated from the same five (!) tubes of paint: a yellow, a blue, a red, a white, and a black. To which I have added, at my mother’s suggestion, a seventh and eighth paint, namely a gold and a silver wash or varnish. This has been a substantial improvement over what I had before. One can also use water as an additive or thinner, but I haven’t had much luck with that yet as a painter. As you can see, this method is yielding some results. I was trying to explain to my lady what I liked about this method, of applying one or two primary paints to a range of canvases, mixing them, and then applying the secondary paint to the same range of canvases. The core of it is this: when I work through my painting process like this, I’m learning — in my hands, in my brain — how to mix colors. I’m learning how to manage the creation of different shades by a very deliberate process. Different kinds of paint produce different kinds of effects when combined; phthalate red and cadmium yellow do different things than a crimson red and an aquamarine blue; but they would also do different things if I was using a powdered paint vs. a watercolor vs. this acrylic vs. some other acrylic vs. oil. 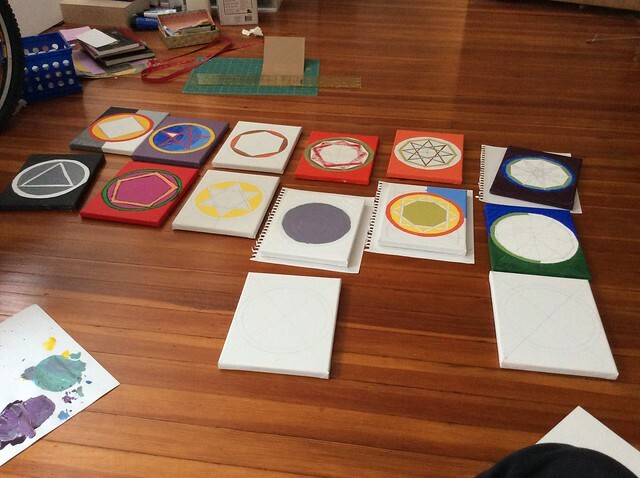 I’m teaching myself a system of color, apparently, but not the only system of color. The results so far have been deeply interesting to me. 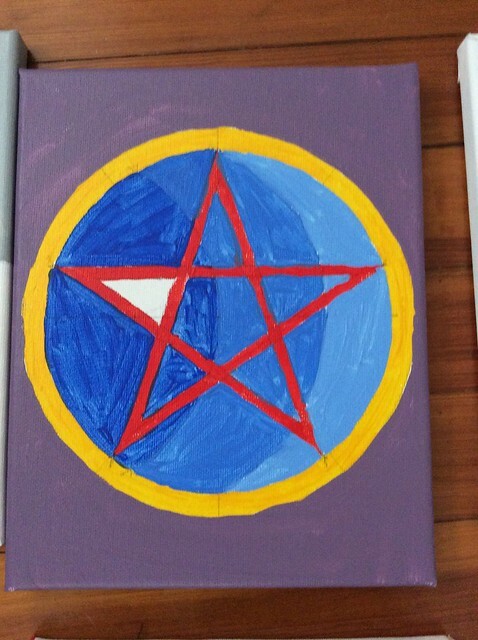 You can see this at work particularly in the third photograph in this entry, namely the one of the red pentagram against a varied blue background. This painting uses a primary red exclusively; and a primary yellow, exclusively (although in retrospect I should have made it more white, and therefore more opaque). The blue background, and the purple ground for the whole image, are produced using exactly the same shade of blue. Yet in each case, it’s mixed (or in one case, unmixed) with another color. In the case of this design, the red of the star has been mixed in unequal proportions with the blue, and with some white. The unmixed blue fills the left part of the yellow ring. The center part of the yellow ring is filled with the blue + white mix, and the third blue — the one on the right — is more or less equal proportions of white and blue. So it’s kind of weird. 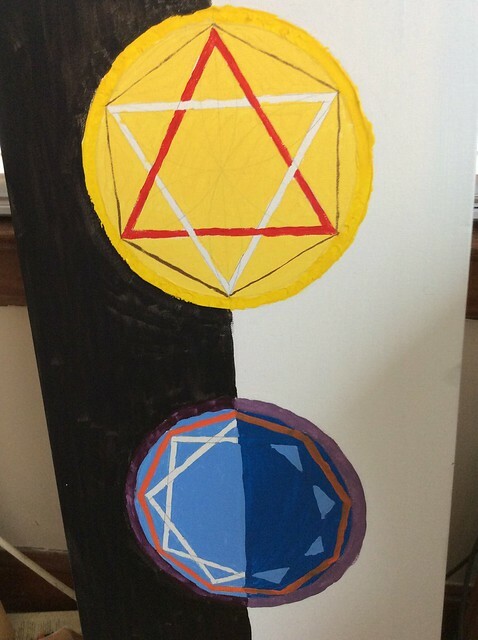 I’m teaching myself color theory by being a painter. This is very different than teaching yourself color theory by reading a book — which is what we’d normally do in schools, actually. But training the eye and mind to see color requires a different set of tools than books and websites. Apparently it requires a painter’s eye, and a palette. I’m closing in on ten. We’ve spent three weekends building a shed, which I’ll call done when we put on shingles. Hoping to do that this week. It’s been a great reminder of the usefulness of geometry. My software project will take a few more months to finish, but I’m aiming for a prototype by the autumn equinox. The lunch bag will get a do-over some evening. Once made, I discovered the design wasn’t quite right. I have some improvements to try out. I enjoy watching your paintings unfold. Makes me wonder what other colors I could get out of the watercolor field kit. Congratulations on the shed. That’s a big deal. I don’t know what other colors would come out of the watercolor kit, but I think that’s sort of the point — the paints that you use, and their quality, turn out to have a lot to say about the eventual range of colors one can produce.